Welcome to today's edition of Nerd Alert, where we have all the day's eccentric, nerdy news for you in one convenient spot. What do we have in store for you on this glorious Friday? The Ghostbusters get animated in a bizarre and controversial way, we have a video breaking down all the Marvel movies that never happened, Beyoncé Knowles' "Single Ladies" music video matches up perfectly to the DuckTales theme song, and much more. So, sit back, relax, and enjoy all that today's Nerd Alert has to offer. There have been rumors that Channing Tatum is being sought to headline a new Ghostbusters that is reportedly being developed separately from director Paul Feig's all-female Ghostbusters reboot. While we may never know if Channing Tatum's Ghostbusters is happening or not, Mashed has debuted a new animated video that features Channing Tatum as the new Ghostbusters leader, who bosses around the original characters. They even have the late Harold Ramis' Egon Spengler as a ghost himself, along with references to horror movies such as The Ring, Alien, The Human Centipede (First Sequence) and Saw. The video is certainly divisive, with some calling it out for its poor taste, while others think it's hilarious. Where do you stand? Marvel movies are bigger than they've ever been, but before their meteoric rise, there were several high-profile movies that never saw the light of day. 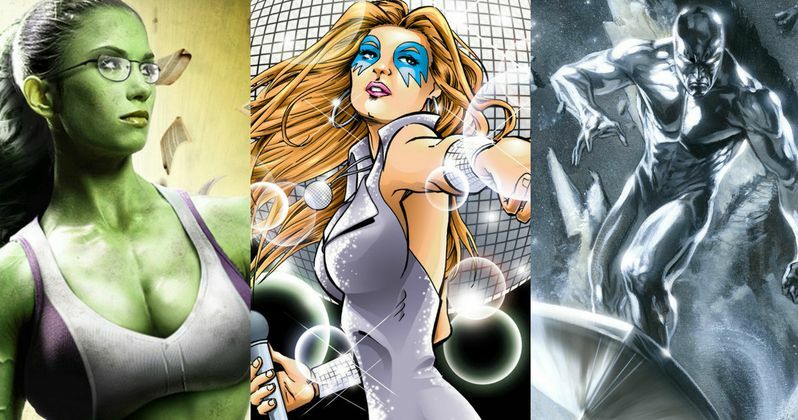 The Dan Cave breaks down these unproduced projects such as James Cameron's Spider-Man, Bo Derek as Dazzler, Brigitte Nielsen as She-Hulk and many more. Beyoncé Knowles' "Single Ladies" song was a smash hit in 2008, with a music video that is just as popular, with over 389 million views on YouTube to this day. The music video may be even better now, with YouTube user The Baroness is Awesome replacing the song itself with the theme to the animated TV series DuckTales. For comparison's sake, we've included both the mashup video and original music video above. Animal Robot has cut together an amusing little video featuring Sesame Street's iconic Big Bird singing Big Pun's hit rap song "Still Not a Player." You'd be surprised at how well the Sesame Street footage and this song go together. Before they went on to host the Golden Globes three times, and star in their respective hit NBC shows 30 Rock and Parks and Recreation, Tina Fey and Amy Poehler hosted Weekend Update together on Saturday Night Live. Entertainment Earth is honoring these legendary Weekend Update hosts with their own action figures, which even come with a Weekend Update set. You can CLICK HERE to pre-order the set, which costs $29.95. It's been nearly two months since Marvel's Daredevil debuted its first season on Netflix, and I'm sure there are several fans who have watched every episode multiple times by now. Mr. Sunday Movies has a detailed breakdown of all the Easter Eggs found in the first season in an extensive seven-minute video. Watch Mojo has compiled a list of their top 10 "futuristic" movie technologies that, today, seem laughably outdated. Among the notable selections are the "public video phone" in Blade Runner, Total Recall's automated Johnny Cab, the wire frame map in Escape From New York and much more. While CW's The Flash is on hiatus after a successful first season, fans can experience a much different version of Barry Allen in a new mod for the popular Grand Theft Auto V video game. YouTube user iCrazyTeddy shows us some of the gameplay as Barry, although it's quite clear that he doesn't have the same super speed in the game as he does on the hit TV series.